user-generated Headlines and reports on this page = 3 news items. Page - 4. LIVERPOOL City Region Metro Mayor, Steve Rotheram has set out his ambitious vision for the future underscored by 10 major new policy pledges. Describing the devolution process as a journey not a destination, he said that the Leaders of the region's 6 districts had not created a Combined Authority merely to access relatively modest additional resources, but to deliver transformational change. Setting out the need for a step change in ambition and economic performance, he announced the appointment of highly respected industry leader, Brent Cheshire, until recently UK Chair of Dong Energy, as the man who will spearhead plans to harness the power of the River Mersey. His initial task over the next 12 months will be to establish the core business case for the multi billion renewable energy project. Steve Rotheram said:- "I am delighted that Brent has agreed to lead this project. It has been debated and discussed for over three decades. Devolution finally gives us the opportunity to deliver a project of this scale, and Brent provides us with the expertise, experience and leadership capability to turn vision into reality." Brent Cheshire said:- "I am pleased to accept the Steve's invitation to head up the Special Purpose Vehicle that will take this project forward. This is a hugely exciting and ambitious vision with the potential to impact massively on the City Region's long term economic prospects. Liverpool City Region has delivered world changing engineering projects in the past, so if it can be done anywhere it can be done here." Focussing on the need to grasp the opportunities of the 4th Industrial Revolution, the Metro Mayor, said the City Region has a unique set of assets, including the UK's most powerful super computer, at Daresbury, cutting edge research facilities and a cluster of digital businesses growing faster than Inner London. To fulfil and accelerate their potential he announced the launch of a 6 month study to make Liverpool City Region the UK's most digitally connected region in the UK, by connecting directly to the GTT Trans Atlantic cable that lands in the UK at Southport, and creating a region wide fibre spine to guarantee every home, business, university, School and public building the best and fastest possible connectivity. Steve Rotheram said:- "If trains, docks and canals made us the gateway to the 1st Industrial Revolution, then world-class connectivity and a plentiful supply of predictable renewable energy can make us the digital gateway to the Fourth. Faster speed, greater capacity and green energy will not only enable us to grow our own digital and technology sectors, it will make us a magnet for investment for global companies wanting the best connections and a carbon neutral energy solution." ► Plans to create a unified and properly resourced agency to capitalise on Liverpool's positive global brand, marketing the City Region internationally and providing 1 front door for all those seeking to invest and do business here. ► A pledge to deliver a skills revolution by lobbying the Government so that the underspend from the National Apprenticeship Levy will be spent locally to roll out degree level apprenticeships and create a single UCAS-style City Region wide portal for apprentices. ► A major initiative to tackle the City Region housing shortage by building 25,000 new homes before 2022 in the right places and with a variety of types and tenures to ensure everyone has access to a decent and affordable home. ► Tackle homelessness by working with Government to fund a trail blazing Housing 1st approach to make sure new homes are made available to those in greatest need as quickly as possible end the scandal of rough sleeping in Liverpool City Region. ► Adopt a brownfield 1st approach to new housing development by publishing the 1st ever City Region Brown Field Register, and lobbying the Chancellor to give the area a Stamp Duty holiday with funds being recycled into remediating brownfield, making them available for new homes. ► Backing up the £460 million investment in new rolling stock for Merseyrail by exploring how devolution powers and bus regulation can be best used to create a fully integrated public transport system for a dynamic and growing City Region. ► Make access to public transport more streamlined and customer friendly by rebranding and remodelling the current Walrus card to make the City Region a UK exemplar for smart ticketing and new payment technologies. ► Making cross river transport and movement easier and more affordable by delivering on an election pledge to create a more affordable Fast Tag for Mersey Tunnel users, and announcing the commissioning of the design for a new state of the art Mersey Ferry. ► Setting out the City Region's future devolution ambitions and begin discussion about how the City Region might to integrate Fire and Rescue, Waste Disposal and powers of the Police and Crime Commissioner into a future Combines Authority Structure.. Explaining that devolution was an opportunity that we simply could not afford to squander, Steve Rotheram said;- "The simple argument for devolution is that local people who are locally accountable know better than Whitehall what our area needs, but it is also about recognising that in an increasingly competitive and changing world, 6 districts with a population of 1.5 million can be more successful and stronger together." Neighbourhood Weekender tickets sell out in 3 hours! THE debut Neighbourhood Weekender taking place at Victoria Park, Warrington, has sold out within the 1st 3 hours on going on general sale. Courteeners and Noel Gallagher's High Flying Birds will each headline the 25 thousand capacity festival, on Bank Holiday Weekend, held over 26 May and 27 May 2018. The stellar line up also includes acclaimed live artists:- Blossoms, Jake Bugg, Kodaline, Editors, The Coral, Circa Waves, Miles Kane, The Sherlocks, Starsailor and some of the best new talent around Tom Grennan, The Big Moon, Fickle Friends, Cabbage, Spring King, Louis Berry and many more. The last few VIP tickets and platinum packages are available via:- NBHDWeekender.com. 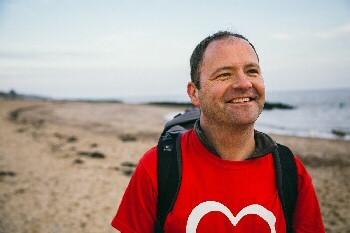 A heart transplant survivor is walking the length of Merseyside's coastline as part of a 5,000 mile trek around Britain to help raise £20,000 for the British Heart Foundation's (BHF) life saving research. 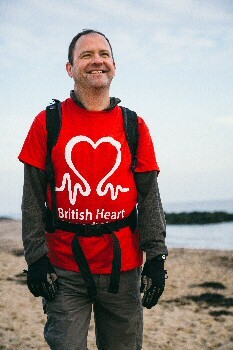 Kieran is calling on the public to support him on his journey by helping him raise £20,000 for the BHF's life saving research, which will bring new hope to an estimated seven million people who are living with heart and circulatory disease in the UK. In Merseyside alone, around 175,000 people are living with the devastating impact caused by heart and circulatory disease. Kieran wants the people of Merseyside to get involved by walking with him, hosting him, or by helping to him organise a fundraising event. You can find out more information or sponsor Kieran by visiting his Just Giving Page. Speaking about his challenge, Kieran said:- "The inspiration for my challenge came to me around 25 years ago, but then it was only something I could dream of because of my health. My 2nd heart has enabled me to do so much and I'm urging the public to help me support the BHF's ground breaking research by making a donation." Kieran's battle with heart disease began when he was just 3 years old, when he had to have open heart surgery to correct a condition called:- 'Transposition of the Great Arteries (TGA).' This is where the main arteries in the heart are 'plumbed' back to front. When Kieran was 13, he suffered a heart attack and during his early 20's he had 2 mini strokes and began having abnormal heart rhythms. By the time he reached 35, he was in heart failure and he was put on the list for a new heart. In July 2009, Kieran received his new heart and donated his old heart to British Heart Funded Research into congenital heart disease, which has contributed to important discoveries that will help others living with conditions like TGA. 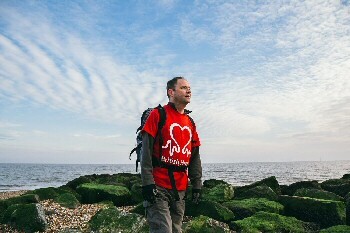 The money he raises on this incredible journey around Britain will help fund even more life saving research. Michelle Bailey, BHF Area Fundraising Manager for North West said:- "We never cease to be amazed by the incredible ways our supporters raise money for our research, but Kieran's coastline challenge is 1 of the biggest fundraisers we've ever seen. We are so grateful for his determination and dedication to supporting our work and we're behind him every step of the way! Every 3 minutes someone in the UK loses their life to heart and circulatory disease, which devastates the lives of those they leave behind. We urgently need more people to join our fight for every heartbeat and help fund our life saving research, so if Kieran has inspired you please do help power his steps and donate!" Travelodge, the BHF's charity partner, will be supporting Kieran by providing him with a room to rest in for the night wherever possible along his route through England and Wales. Berghaus, the outdoor clothing and equipment brand, is supporting Kieran on his walk by providing clothing, including a waterproof jacket and warm winter wear. To support Kieran on his 'Trail of 2 Hearts,' visit:- ATrailOfTwoHearts.Com.